Deadman’s Hill is a beautiful vista with a sad story. One of the most beloved viewing points for leaf peppers in the Lower Peninsula is something of a memorial to a young logger named Stanley Graczyk. The twenty-one-year-old was a fun-loving lumberjack in the early 1900s, known as “Big Sam” to his friends and fellow loggers. On May 20, 1910, Big Sam was to marry his childhood sweetheart and on that morning he was working the steep ridges of the Jordan River Valley with his crew. Poor Stanley never even made it to the altar. He was driving a team of horses and a “Big Wheel” loaded with timber down the ridge when the huge cart slipped out of control and ran over him, killing him instantly. It’s been called Deadman’s Hill ever since. Today it’s a scenic spot with views of much of the Jordan River watershed, and an especially popular destination during the height of fall colors. But the top of Deadman’s Hill also serves as the trailhead for the Jordan River Pathway, a 2-day backpacking trip of 18.7 miles, and Deadman’s Hill Loop, a 3.1-mile day hike that combines a walk in the woods with a little bit of logging lore. 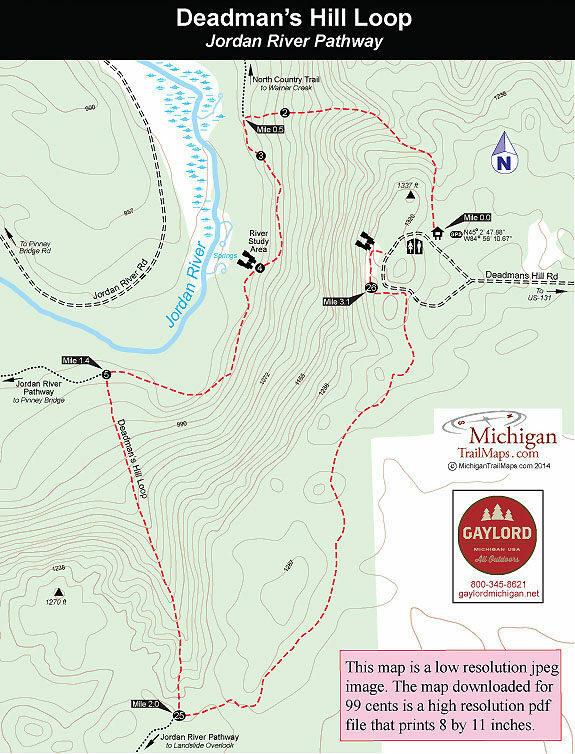 The short loop includes a downhill section in the beginning and some uphill walking at the end, but the trail is wide, easy to follow, and a hike that can be accomplished in a pair of sturdy tennis shoes. Just keep an eye out for those runaway Big Wheels. 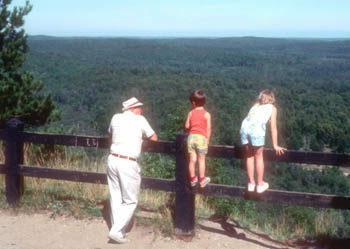 The hike begins and ends at the overlook. From the spectacular views on top of the ridge, you begin the trip by dropping quickly into the valley. The long descent to the valley floor lasts 0.5 mile, but along the way you pass several tree identification signs. The first is a rare one in Michigan, pointing out an elm tree that somehow survived the spread of Dutch elm disease in the 1960s. You bottom out at a junction where the North Country Trail merges with the Jordan River Pathway, and then take a sharp 180-degree swing to the south. For the next 0.5 mile the trail skirts Deadman’s Hill, with the bluff rising steeply above and below you, and a mile from the trailhead you arrive at a gate. Parts of the Jordan River Pathway were re-routed in the mid-1990s, and the gate is used to block the old route. The trail now descends to the River Study Area, an observation deck where you can watch a spring pump cold, clear water in the Jordan River. The gurgling is almost nonstop for the next 0.3 mile as you cross several more feeder creeks beneath the cool shade of giant cedars. At Mile 1.2 you break out to views of Deadman’s Ridge, and in another 0.2 mile you arrive at a junction where backpackers continue west but you swing south. The cut-off spur first moves through an open area where sandy soil supports a healthy crop of wild berries. 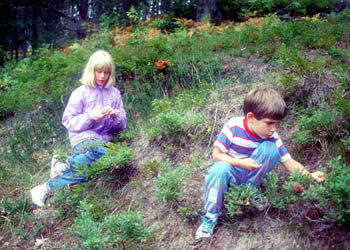 If it’s early to mid-summer, search low to the ground for strawberries. If it’s high summer, then it’s raspberries you’re after, and in mid- to late August blackberries will appear. This portion of the trail might take you a while to get through. It’s hard for any hiker to pass up a ripe berry. Eventually the trail reenters a young forest and begins a steady but never a steep climb. You top off at a posted junction at Mile 2. The trail from the west is the return of the backpacker’s route, while the one to the east is the path to the parking area. The walk is an easy 1.1 miles from here to the end, with only a slight climb now or then. The end of Deadman’s Hill Road is a loop and includes a small parking area and the trailhead for the Jordan River Pathway, marked by a large trail sign and a box to leave your hiking plans. Before arriving, fill up your water bottles. There are vault toilets at the overlook but no drinking water. There are no entry or vehicle fees to hike the Deadman’s Hill Loop. The trail is open year-round and can be easily hiked from May to November without fear of snow. 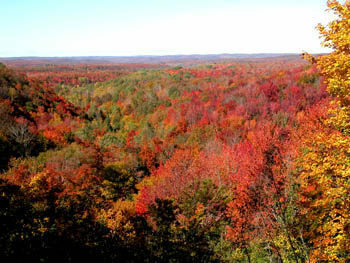 Fall colors peak in early October. Deadman’s Hill is located off US-131, 11.5 miles north of Mancelona or 6 miles from the hamlet of Alba. From US-131 turn west onto Deadman’ss Hill Road and follow it for 2 miles to a parking area at the end. Contact the Gaylord office of the Department of Natural Resources (989) 732-3541.